City of Elk Grove Event Sponsorship Grant Program should be an Equitable Process - Was preferential treatment given former Mayor Gary Davis? One of the key functions of any local government is policy development and the city of Elk Grove is no different. Developing and implementing these policies are key elements which are critical to a local government’s function of peace, order and most certainly, good governance. The same is true with the event sponsorship funding which is also afforded charities through an application process. Those applications are also vetted by city staff, voted on and approved in an open meeting by the Elk Grove City Council before the public. . . or are they? Is there a Catch 22 at play here? Or at the very least, bending of the rules? One look at both the Elk Grove CDBG & CSG Grant Funding - 2017-18 and the Event Sponsorship Grant Program Application – FY 2017-18 applications – see attached – you will see the applications are indeed arduous, lengthy, ask a lot of questions and require a lot of information and detail of both revenue and expenses. And rightfully so. The public should know exactly how the money is going to be spent. However, do the local charities know they can bypass the event sponsorship application process entirely? No Council approval and no public input if they submit their request via email, absent of any application process, midyear directly to Elk Grove City Manager Laura Gill; even though the application states to the contrary. That is exactly what occurred with the newly formed nonprofit public benefit charity, the Elk Grove Community Council. 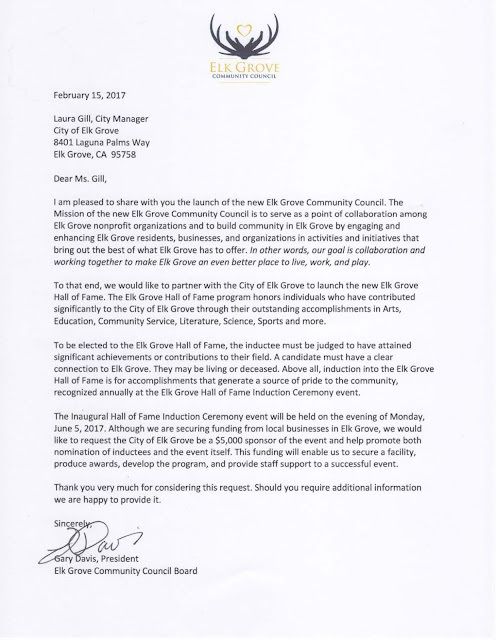 Former Elk Grove Mayor Gary Davis, and President of the Elk Grove Community Council, took over the Elk Grove Hall of Fame – a proposal written by this author – and in doing so sent a one-page letter to Gill requesting a city of Elk Grove sponsorship for the upcoming Hall of Fame event. Within a day of receiving the letter – see below – Gill approved a $5,000 sponsorship and authorized the check to be cut the very next day. Did Davis receive preferential treatment from Gill? An argument can be made that he did. Davis, as a former elected official, should know firsthand that good governance is about the processes for making and implementing decisions. It’s not only about making correct decisions, but about the best possible process for making those decisions. Some of the processes, I might add, Davis himself put into play during his 10-year tenure on the Elk Grove City Council. That is why in making the request midyear for special event funding, and knowing what processes are in play, Davis should have, at the absolute minimum, filled out the same application required of all the other local nonprofit charities and he should not have been able to secure taxpayer monies with just a one page letter. Good governance is about accountability, transparency, is equitable, and should promote community confidence. There should be no preferential treatment whatsoever or bending of the rules. Community members are more likely to accept the outcomes if the process has been good, even if they don’t agree with the decision. That did not occur with the event sponsorship funding Davis received. When any business of the people, including the city’s event sponsorship funding, is done outside of the public’s purview, and not according to written policy, it undermines the entire governmental process and fosters distrust. Copyright © 2017 by Connie Conley. All rights reserved. This $5,000 "gift" is just the tip of the iceberg I am afraid. As a 501(c)(3) non-profit, the Mayor Emeritus gets to pull a salary by acting as a middle-man to other charities in the region, plus deduct home office, transportation costs, etc. from his taxes. His web site (link below) is soliciting sponsorship, and get this, for a minimum pledge of $20,000 per year, you can be a platinum sponsor! Now get this-one of the Board Members of his non-profit is Chuckie Hitchcock of the Wilton Rancheria tribe. Remember the MOU between the City and the tribe that requires the casino to pay the City annual contributions to unspecified charities? What group do you think will dispense the money, with a slight handling charge paid to the Emeritus of course? As time goes on, it seems like the "wanting to spend more time with family" was a ruse, and what we are beginning to see is a remake of the 1958 movie classic, "Run Silent, Run Deep". Thankfully, the IRS requires the annual tax return of 501(c)(3) non-profits to be made public. I will be waiting for April 15, 2018...down periscope!